Emerald Green arborvitae is the common name for Thuja occidentalis 'Smarrgd.' Thuja is a conifer and part of the Cupressaceae family, related to juniper, cedar and cypress trees. Thuja foliage has an almost fern-like appearance with sprays of tiny, scale-like leaves and upright cones. 'Emerald Green' is the English variety name for 'Smarrgd,' and is one of many Thuja occidentalis varieties on the market. It is often used for specimen planting and hedging. Individual plants grow to about 20 feet tall and 5 feet wide. It may or may not be eaten by deer. Experts, including those at Rutgers University (New Jersey) Cooperative Extension, say that no plant is completely deer proof. When deer herds are large, natural predators are few and civilization encroaches on rural areas, hungry deer will eat almost any plant. Plant damage tends to be worse when snow cover and extreme cold make vegetation scarce. In spring, deer also relish tender emerging vegetation. Food preferences may vary by area. A plant consumed readily in one part of the country may be avoided by deer in another region. Overall, deer seem to choose arborvitae over other food plants. 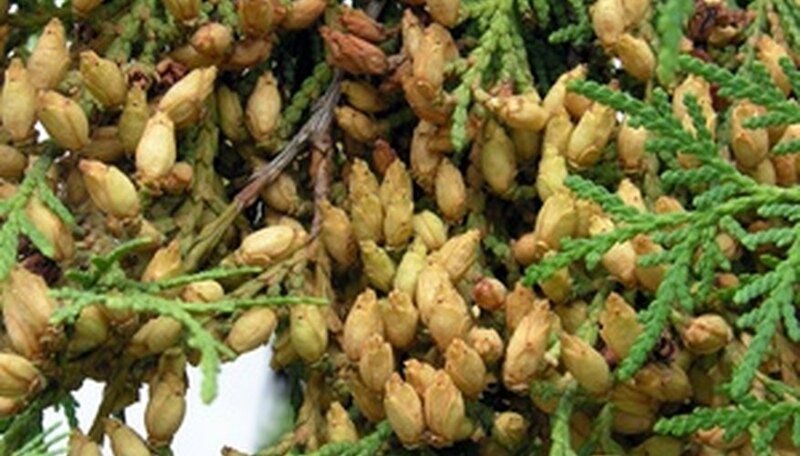 According to the West Virginia Extension Service at West Virginia University, Thuja occidentalis is among plants "frequently damaged" by deer in West Virginia. The Arbor Day Foundation categorizes "American arborvitae" as "least resistant to deer" and "frequently severely damaged." Authorities at North Carolina State's Cooperative Extension Service concur, listing Thuja occidentalis or arborvitae as "frequently damaged" by deer. Young trees are at the greatest risk of being eaten by deer or having bark damaged by deer antlers. Encircling young specimens with cylindrical wire cages is one way to deter the animals. 'Emerald Green' arborvitae, with its abundance of low-growing branches, is susceptible even as a mature specimen, so it is best to grow it in a fenced-off area. Since it can be prohibitively expensive to fence an entire property, the arborvitae can be grown in a dedicated zone or portion of a property. Other, less-palatable shrub varieties can be grown outside this zone. Many gardeners apply deer repellents to valued specimens. However, with 'Emerald Green' and other large shrubs that are often grown as hedges, repellent application may be impractical. Most repellents also need to be reapplied regularly, especially after rain storms. A single mature 'Emerald Green' might be treated with repellent, as only the bottom half of the shrub would be within reach of hungry deer. If it is impossible to keep deer away from your 'Emerald Green' arborvitae, it may be best to try another evergreen variety that the animals find less palatable. For hedging, Japanese privet (Ligustrum japonicum) or European privet (Ligustrum vulgare) might make acceptable substitutes. For specimen plantings, try evergreens like Japanese cedar (Cryptomeria japonica), Colorado spruce (Picea pungens glauca), Scotch pine (Pinus sylvestrus) or Douglas fir (Pseudotsuga menziesii). Are Hibiscus Plants Deer Resistant? How Fast Do Arborvitaes Grow?